A senior member of the Garment Manufacturers Association in Cambodia (GMAC) on Sunday endorsed the use of deadly force by military police against striking garment workers, which left five dead and more than 20 with gunshot wounds. Military police opened fire indiscriminately when they were pelted with rocks by hundreds of garment factory protesters on Veng Sreng Street in the city’s Pur Senchey district, where thousands of workers are on strike for a raise in the minimum wage. The protesters had set up barricades on the road and had made crude, mostly ineffective Molotov cocktails. While one local rights group called the killings the worst case of state violence against civilians in 15 years, GMAC Secretary-General Ken Loo said Sunday that the authorities had responded appropriately. Mr. Loo said the military police were in the right to open fire on the protesters. 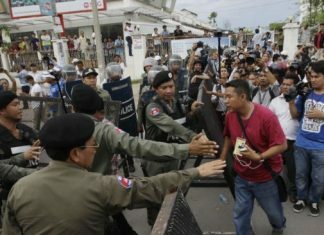 Prior to Friday’s deadly clash, GMAC had urged the authorities to take tougher measures against six unions—all known to be independent of Prime Minister Hun Sen’s government—and their members’ strike action, which had already involved small amounts of damage to factory property, as well as the alleged intimidation of workers who did not want the strike. As of Sunday, the unions had yet to decide whether to press ahead with the protests. “We will probably change our plan to hold protests on Monday because we don’t want more workers to die because of the demonstrations,” said Chheng Lang, vice president of the National Independent Federation Textile Union of Cambodia. Ms. Lang said the six unions had not had a chance to settle on a joint position regarding their ongoing strike action following the killings and violence on Friday. Union leaders are too scared to meet, and many garment workers have fled the city for their homes in the provinces, Ms. Lang said, adding that Rong Chhun, president of the Cambodian Confederation of Unions, is also in hiding after receiving a summons for questioning from the Phnom Penh Municipal Court. “The union leaders are now worried about their safety after a union leader received the summons from court. The other unions are now scared of arrest,” she added. On Thursday, the six unions had agreed to spread their protests for a $160 minimum monthly wage—-so far mostly confined to Phnom Penh—across the country unless the government and factories agreed to resume wage negotiations by Saturday. Neither the Labor Ministry nor GMAC has been in contact since Friday’s bloodshed, Ms. Lang said. for allegedly inciting violence. Kong Athit, vice president of the Coalition of Cambodian Apparel Workers Democratic Union, also said the leaders of the six unions, which included his own organization, had not yet had a chance to discuss their future plans, and their leaders are now afraid of arrest. their strike or face legal action. “We have scheduled a meeting with those union leaders to tell them to not create problems that can cause chaos at the factories,” he said. Mr. Loo, of GMAC, said he did not know how many garment workers were still present in Phnom Penh to return to work, but he added that most factories would try to open today. He said the industry, which generated more than $5 billion in revenues last year, would recover. “Damage was done for sure but I don’t think it’s irredeemable,” he said. Rather than hurting the industry, Mr. Loo said the strong state response to the protesting garment workers would reassure investors and keep them from pulling out. “The authorities cracked down on the protesters—that’s a step in the right direction,” Mr. Loo said.